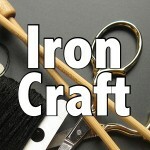 For this Iron Craft Challenge, we were told to make something using a natural material. 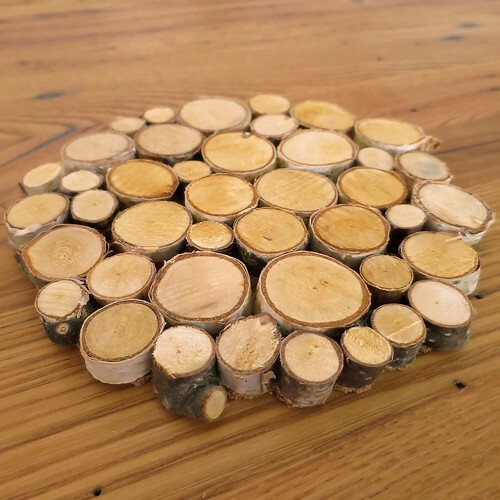 We bought a beautiful reclaimed wood table for our new house which I want to protect from heat and it has been difficult to find stylish trivets. 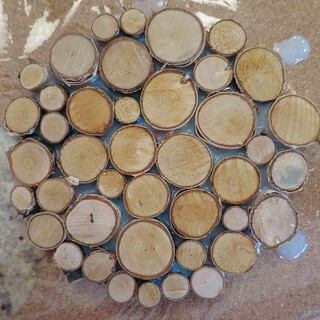 So, I decided to make a trivet from wooden slices like I’ve seen in boutiques around town (for quite a bit of money). 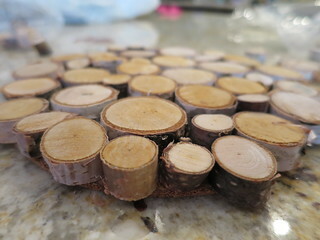 My original plan was to gather some fallen branches and cut them into slices myself, but we have had such a wet spring/summer that I knew finding dry branches would be hard. I found lots of people selling the slices on Etsy, but knew I wouldn’t have the time to get them shipped. Luckily, Michael’s carries bags of birch slices that are all similar height, but mixed widths. I bought three bags, because I wasn’t sure how many slices I was going to need and I wanted to have a good mix of sizes to use. It cost me about $15 for all three bags. I’m glad I did buy so many, because they weren’t all as close in height as I had hoped. I ended up having enough for the circle size I was doing once I sorted them out though (and I have a lot of slices left for other projects). I also could have sanded some of the pieces down a little if I needed too. One thing I wished I had had were some thinner slices to fill in some of the gaps, but it wasn’t a deal breaker on how I felt about the final result. 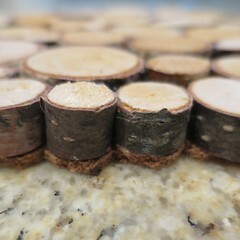 birch (or other tree) branch slices, about 1/4″ – 1/2″ high (You can use any height you want just make sure they are all close the the same height.) and various widths (Mine were between 1/2″ and 1 1/4″.). 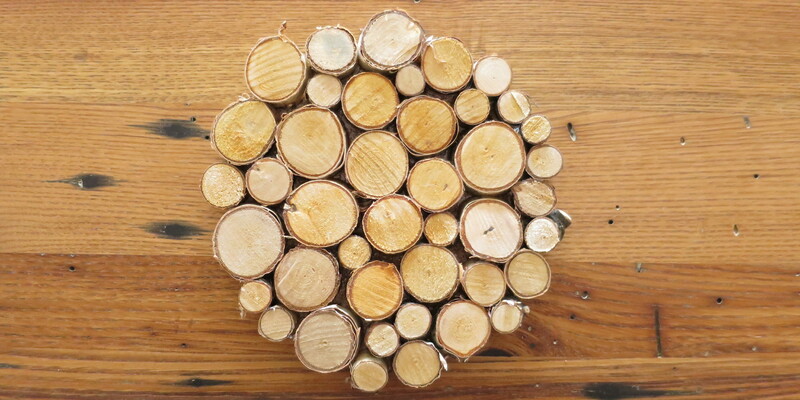 I used 41 slices to make a 7″ trivet. 1. 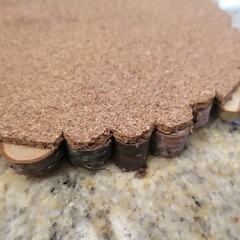 Cut a circle from the cork approximately the size you want your trivet. I used a desert plate as my template for a 7″ trivet. 2. 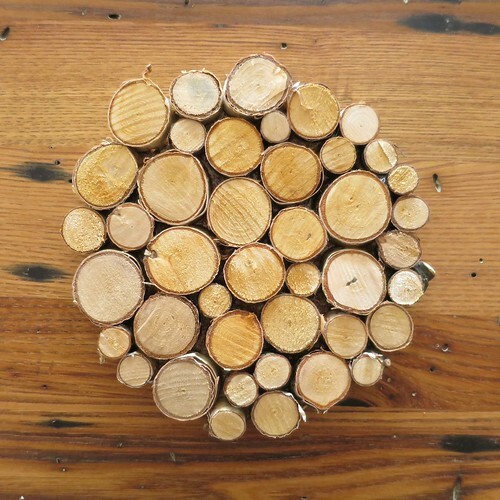 Lay the wooden slices out on the cork circle until it is as covered as you can get it and you are satisfied with the look. Try to use slices that are as close in height as you can. Mine were not perfect, but pretty close. I tested it with bowl on top to make sure things would sit on it securely. 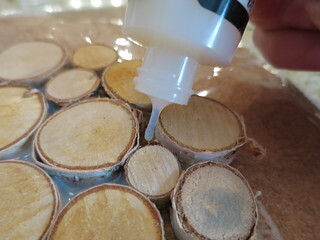 Hot glue the slices onto the cork. I found it was easiest to do the outer circle first and then the inner ones. Clean up any stray hot glue strands. 3. Use the Glossy Accents to fill in the spaces between the slices. 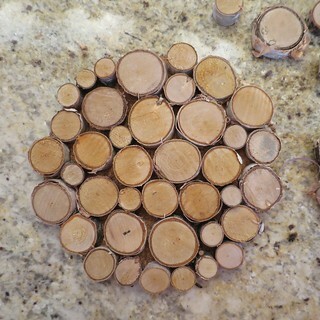 This will make the trivet a lot more sturdy. I did this step on a piece of wax paper so I could easily get it off if there was any leakage. I chose not to go back and add more of the Glossy Accents as I liked the way it looked just around the base of the slices, a bit like natural tree resin. Plus, I was a little worried about having it right up against hot dishes and whether it might melt or fog up. 4. If you have leaks that hang over the edge you can cut them off with an exacto knife. 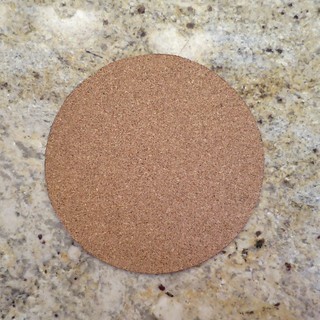 As you can see in the photo above there are places where the cork showed around the edges too. 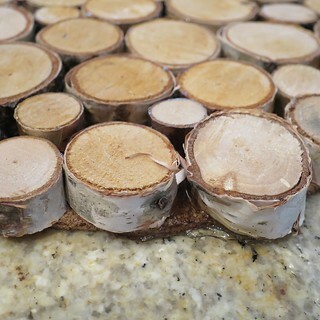 I decided I didn’t want that either, so I also cut it out around the wood slices with the knife. That is totally optional and just my being a little obsessive. It looks really great on my wooden table! 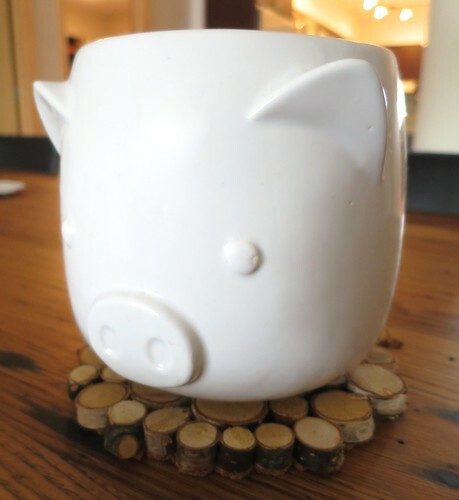 5 years ago by Kat in Challenges , Craft Projects , Crafts , Home , Projects | You can follow any responses to this entry through the RSS feed. You can leave a response, or trackback from your own site. Another amazing project, although I don’t think that my OCD would allow me to complete it. I would be a “measuring and sanding fool” trying to get them all to be the same size–LOL. It looks beautiful.